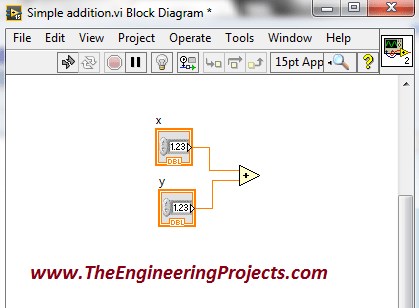 A complete step by step tutorial on Creating First Project using LabVIEW Programming. Hello everyone! I hope you all will be fine. Today, I am going to elaborate that how to create your First Project using NI LabVIEW Programming. This software is very easy to use in comparison to the other software. You do not have to write the complete source code for the desired output, like in other software e.g. Arduino, MATLAB, Dev C++, Eclipse etc. instead you have to just implement your logic using Field Programmable Gate Array (FPGA) blocks. The program is designed with the help of the FPGA blocks, is usually known as “Virtual Instruments”. Normally we used to call it as VI’s. 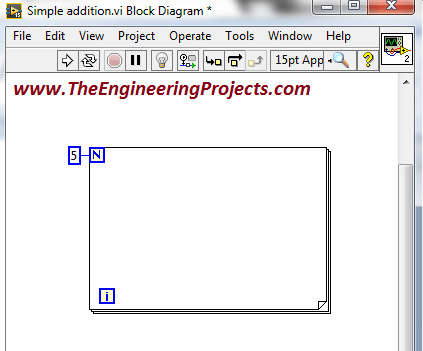 We create in “Block Diagram” window as described in our previous tutorial on Introduction to LabView. If you haven’t read that tutorial then I owuld suggest you to read that one first because I have given a detailed introduction to LabView software and today’s we are gonna have the same introduction but about LabView Programming. So, today we are gonna design our first project using LabView Programming and you will see how easy it is in LabView Programming. If you ask me then when I was a beginner on LabView Programming then it seems to me the most difficult programming Language but now I can say that LabView Programming is the most easiest and flexible one. 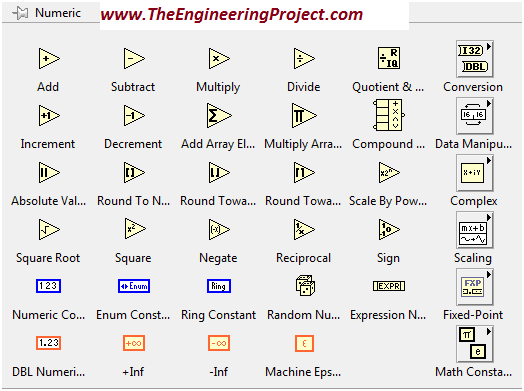 Labview has a great online support, yu should also have a look at this online LabView Community because its very extensive and has great projects and tutorials. Here I am going to guide all of you, about creating your first program using NI LabVIEW Programming. First of all create a new project as we have done in our previous tutorial Introduction to LabView. 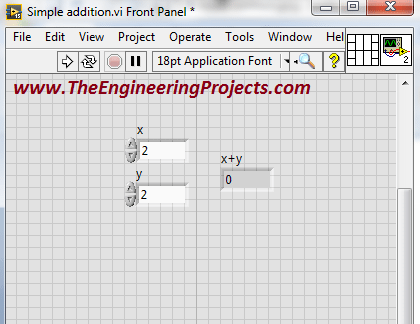 Now once you created the project you will have two windows in front of you named as Front Panel and Block Diagram. 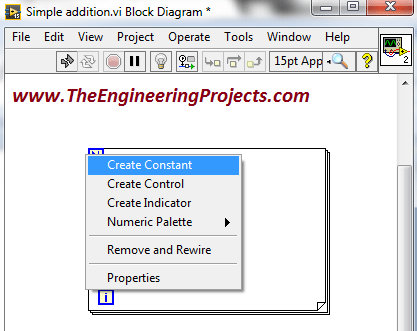 I will start the very first step by simple adding two parameters in our Block Diagram. 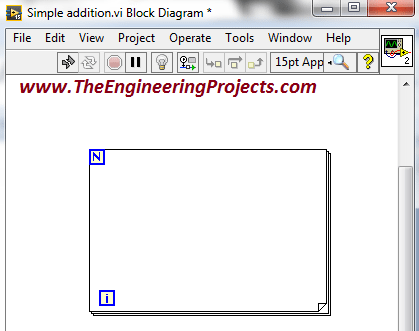 So, open your “Block Diagram” window and go to Functions-> Programming-> Numeric. 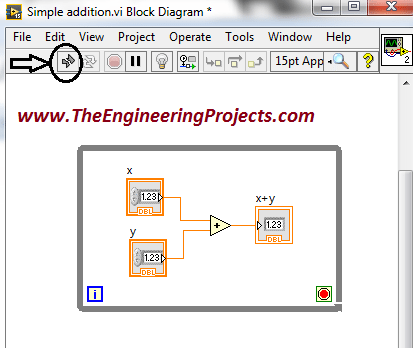 Select the very first block named as “Add”, its an addition operator in LabView Programming. Drag and place it on the “Block Diagram” window. You can see that it has two input terminals (x and y) and only a single output terminal (x+y) which shows that this block gives only one result by manipulating the two different parameters simultaneously. Inputs are known as “Controls” and outputs are known as “indicators“. Since we want to manipulate the two parameters by changing them according to our requirement so we will make the input terminals as “Control”. Place the cursor on one of the input terminal and right click it. 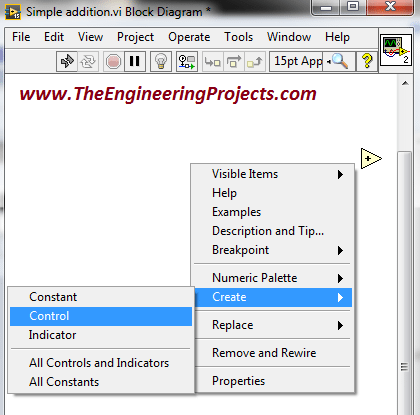 By pressing the “Control” option, one input of this block can be controlled manually by you. Similarly, perform the same procedure on the second input terminal. Now we have to observe the output of the block, which is now manipulating the two input parameters. 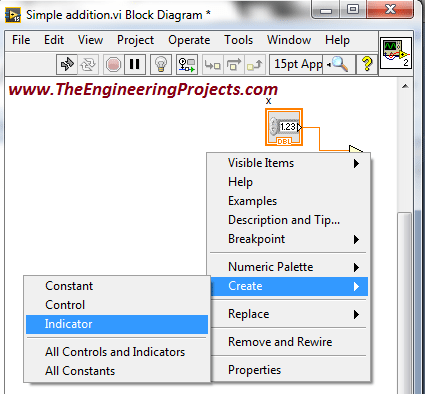 Place the cursor on the output terminal of the block and make a click on it. Now, go to Create-> Indicator because we have to display the output. Press the “Indicator” option and you will get an indicator on your output pin. 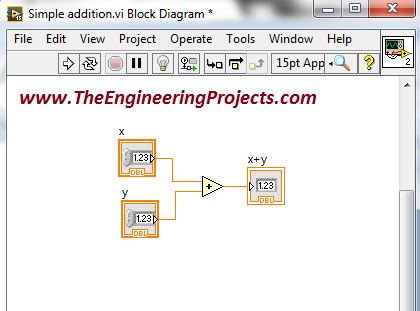 Now our first project using LabView programming is completed in the “Block Diagram” window. Since we have create our project with the help of FPGA blocks. So, what we have to do is to observe the output of the designed algorithm. 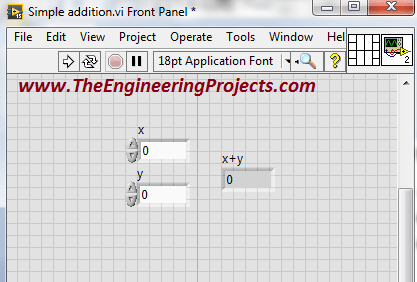 So now, we need to go to the “Front Panel” which helps us to show the output of the program as described in detail in our previous tutorial Introduction to LabView. On the left side of the “Add” block there are two inputs represented by as “x” and “y”. And on the right side there is a single output represented by “x+y” to perform the addition operation. Now adjust the both of the input parameters to obtain the desired output according to the adjusted parameters. 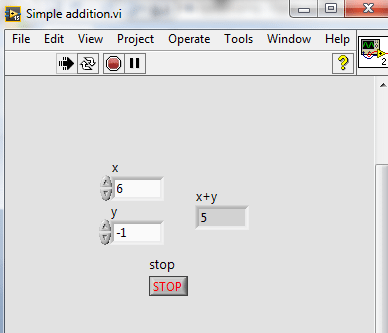 Here I have adjusted “x” input by assigning it with a value “2”. And I have adjusted “y” input by assigning it with a value “5”. How to Run LabView Simulation ??? You can see the output of the program has been successfully obtained according to the adjusted input parameters. 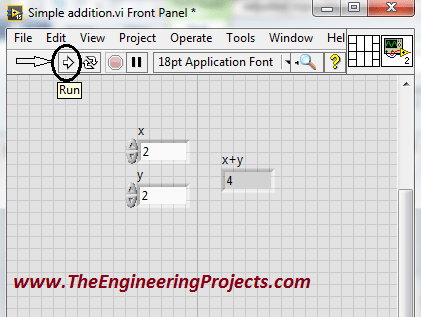 So that is how you can perform the simple addition of the two parameters in LabVIEW. You can also use the all of the other operators in the Functions-> Programming-> Numeric similarly to perform different operations for the different input parameters according to your own requirements. In previous part, you can see that as you compile (run) your program it shows the desired output and then terminates. That means if you have to change input parameters then you have to run your program again as well. Now I am going to explain you that what to do with this program, if you want that this should run for a number of iterations. There is “For Loop” option which helps us to run our designed algorithm for number of iterations we want. 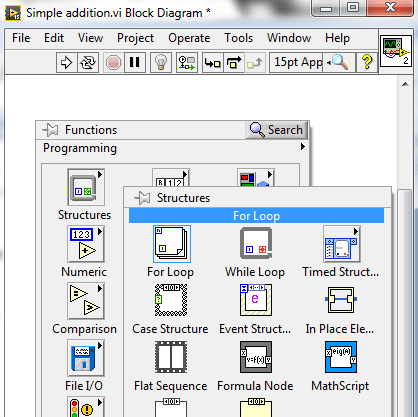 Select the “For Loop”, drag and place it in the “Block Diagram”. You can see that there is a “N” symbol on the top left corner of the “For Loop”. Basically the symbol “N” shows the number of iterations for which we want to run our program. Go to the input terminal of the symbol “N” and click on it. So, set the number of iterations according to the requirement. Now your program will run for five iterations. If you want that your program should have continue to run until you terminate then it is also possible. “While Loop” option will be helpful for us in such a condition. 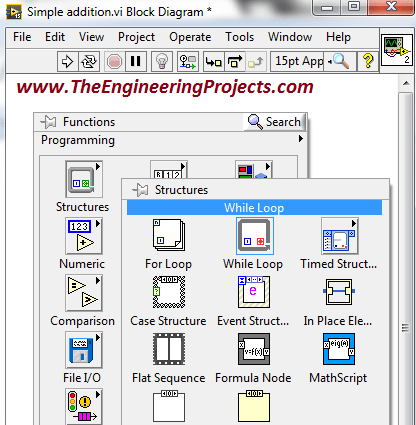 Here I will tell you how to select the “While Loop” in this software. It is quite similar to the selection of the “For Loop” described in previous section. 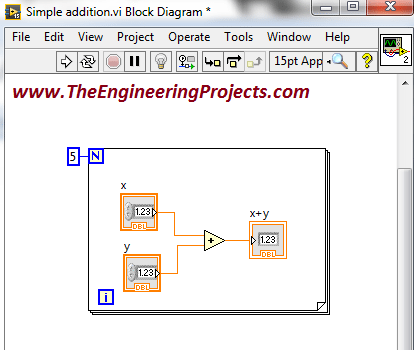 Select the “While Loop” drag and place it on the “Block Diagram” window. You can see there the “Run” button is not in a normal condition which shows that there is some problem with the program. It is due to the fact because we have not yet defined the terminating condition of the program. Now, go to the “Front Panel” window and right click on it. Now you can see that the “Run” button is now again in normal state which shows that the everything is going fine with the program. Now, run the program and it will continue to run until you press the “Stop Button” in the “Front Panel” window.